Now That We Have European-Style Healthcare, is A European-Style Tax System Next? 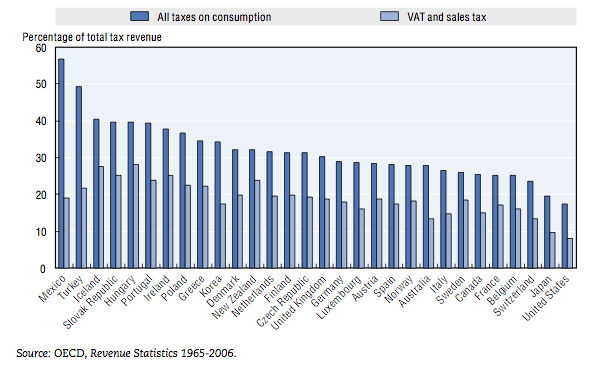 Photo: OECD: Consumption Tax Trends: The Way Of The Future? Over at the Washington Post, The dean of the neocons Charles Krauthammer warns: Now that we have a big bad, European-style socialized healthcare system, it’s inevitable that our tax system will come to look more European as well. In order to finance our burgeoning deficit — the growth of which seems pretty indisputable — Krauthammer expects to see a VAT (value-added tax) which, he says, would raise $1 trillion per decade for every 1% tax imposed. Importantly, he’s not talking about a substitute for our existing tax schemes, but an addition. At first blush, there wouldn’t seem to be the political will for tax hikes — not after a bruising healthcare battle. And if Republicans do well in November, that the issue may be scotched before it can hope to get off the ground. But Krauthammer is right to sense that something is afoot. In his recent Letter from Washington piece, Bloomberg’s Albert R. Hunt cites the work of Columbia University tax prof (and former Bush I Treasury official) Michael Graetz who argues for a VAT (though one that would replace our existing system of taxation). Graetz is the author of 100 Million Unnecessary Returns: A Fresh Start for the U.S. Tax System which argues that we could easily do away with tax filing for a huge chunk of the population if we shifted towards a consumption-based scheme (albeit one with various other measures in place to insure progressivity). For those interested in Graetz’s work, his paper is below. We’re still sceptical that it can actually happen… though if the bond market really is the canary in America’s budgetary coalmine, activity on the tax front may be inevitable. Also, following the November elections, The President’s panel on fiscal sustainability is expected to come back with some suggestions on how to fix our budget problems. Because it will be dominated by Democratic appointees, the most likely outcome will be a call for more taxes. That alone will get the discussion going, if not any actually action.